Caitlin was the wife of poet Dylan Thomas. At the start of the 1970s, twenty years after he died, she started going to Alcoholics Anonymous. In a circle of chairs, set out for an AA meeting Caitlin makes a determined effort to deal with her tempestuous past. The audience sits in the circle with Caitlin as she revisits her life with Dylan. It is a relationship fuelled by love, addiction, jealousy and infidelity. 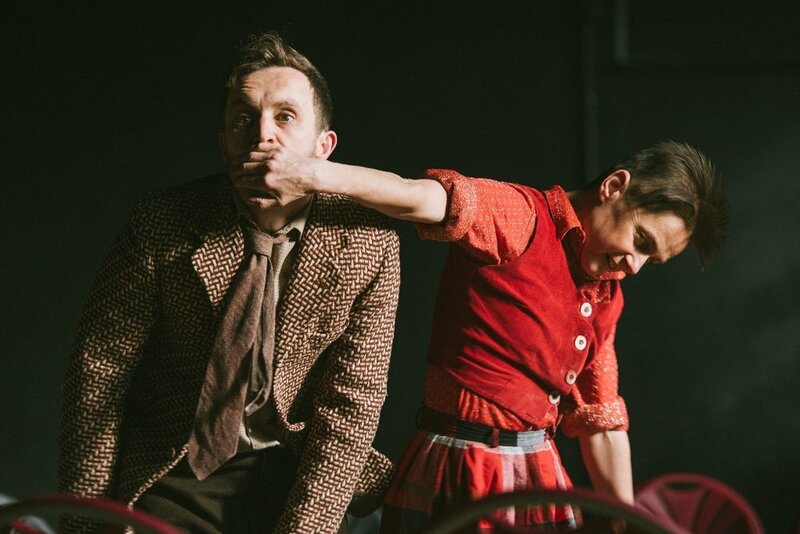 As Caitlin and Dylan drink, fight, love and leave each other the unoccupied chairs become part of the action in this physical and powerful duet. Commissioned by National Library of Wales for DT100/ Dylan Thomas centenary in 2014. CAITLIN has toured several times from 2014 till now, including a run at Dance Base for Edinburgh Fringe 2015, a week at Battersea Arts Centre for #ANationsTheatre, and as part of the British Council Edinburgh Showcase 2017. It is available for touring in the future. Laura Drane: lightladdemberton@gmail.com & +44(0)7957622623. Caitlin Promo.Cut2HR2 from Culture Colony on Vimeo.